Pirates & Privateers : Why do boats disappear in the Bermuda Triangle? Question of Malamy (11.13.2015): Why do boats disappear in the Bermuda Triangle? 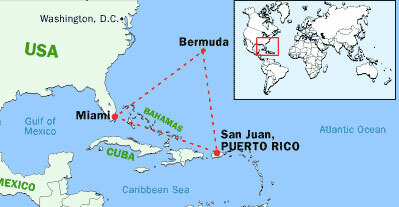 A: The disappearance of ships in the Bermuda Triangle is due to a natural phenomenon well known today. The cause of disappearance of ships and aircraft is methane. The Bermuda Triangle seabed contains huge methane reserves. If an earthquake or strong currents occur at that location, it causes landslides releasing methane bubbles, which alter the density of the surrounding water. Vessels have no more lift and flow like stones. The methane released into the atmosphere is also dangerous for aircraft. The seabed contains pockets of gas, in particular methane, from the degradation of plants or dead animals. A light earthquake or strong currents produce a landslide, exposing the gas pockets. In escaping the giant bubble leaves behind a crater in the seabed. The bubble explodes on contact with the hull of the boat, then falls to the bottom of the gas cavity. Walls of water around the boat and immediately overwhelms. The ship is sinking like a rock, leaving no trace of its passage. In the Gulf of Mexico (southwest of the Bermuda Triangle), a similar phenomenon of disappearances of ships also exists. 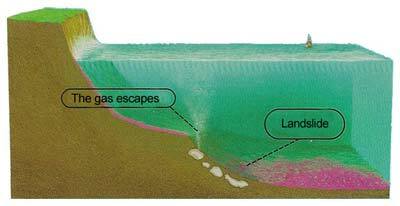 It is no underground deposits containing natural gas, but crystals buried in marine sediments, which are sort of marine gas tanks, called "methane hydrates". It has the appearance of snow blocks, and when the pressure becomes stronger and temperatures drop, a warm water current flow can melt and thus release gas hydrates which decompose into methane and water.